“Proverbs from A Common Man and Wife: We serve God! He is large and in charge! Let go of what you do not know or understand, and let God take care of it,” from Christian Faith Publishing authors Bobby and Patricia Hickman is a thought-provoking compilation of personal accounts with themes of godliness and faith. “Proverbs from A Common Man and Wife: We serve God! He is large and in charge!”: an inspiring collection of testimonies, Bible devotionals, and captivating stories that delve into new perspectives of spirituality. “Proverbs from A Common Man and Wife: We serve God! He is large and in charge!” is the creation of published authors, Bobby and Patricia Hickman, a down-to-earth husband-and-wife team married for nineteen years, and living in North Central West Virginia. Published by Christian Faith Publishing, Bobby and Patricia Hickman’s new book is not like any Bible devotional; it provides a novel perspective of the grace and love of God. This book traverses the common questions people ask regarding faith in God, and answers them with thorough explanations based from the Bible. Topics and themes such as endurance, trials and tribulations, together with personal testimonies, present a fresh viewpoint of God’s affection to his people, and one’s faith in him. 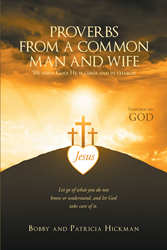 View a synopsis of “Proverbs from A Common Man and Wife We serve God! He is large and in charge!” on YouTube. Consumers can purchase“Proverbs from A Common Man and Wife We serve God! He is large and in charge!” at traditional brick & mortar bookstores, or online at Amazon.com, Apple iTunes store, Kobo, or Barnes and Noble. For additional information or inquiries about “Proverbs from A Common Man and Wife We serve God! He is large and in charge!”, contact the Christian Faith Publishing media department at 866-554-0919.